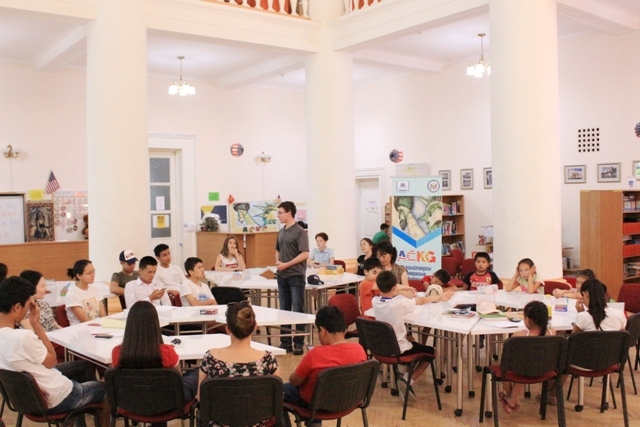 About a month ago, I had the opportunity to travel to Bishkek, Kyrgyzstan and participate in several programs organized by the local American Corners. I have found myself lately reflecting upon a conversation from one of these events. I believe that it exemplifies both the challenges and the immense opportunities that face Americans abroad in 2017. The event was a talking club in which the students posed questions to me in English and I did my best to answer them. There were no limitations: they could ask me whatever they wanted to. Questions ranged from education at American universities to my definition of happiness. Then, a student asked a very unexpected question. I paused for a moment to gather my thoughts, for this was by far the most sensitive question I had received. On a personal level, my answer was clear: as a social liberal, I believe all people should be free to be themselves. But I felt like my answer had to be more than just my own personal response, for several reasons. First and foremost was the fact that I was addressing an audience that was very different from my peers back at university. Attitudes towards LGBT individuals in Kyrgyzstan are quite different from those in America. Further complicating the matter was the fact that although the answer would be my own, I was also speaking as an American. My answer would influence how these students viewed America. It was this consideration that helped me realize that my personal views were directly informed by my understanding of American values. In the promise of liberty and equality for all, I recognized the same ideals that inspired my beliefs. My answer was an American answer. Although I cannot be certain what the student thought of my answer, I can say that his question pushed me to think more about myself and my country. As an American abroad, I am a representative of my country. It is undeniable that in 2017 this responsibility has become difficult. But the ideals at the core of America – freedom, liberty, equality- still hold the same radical promise as they did before. It is because I believe in these ideals and our progression towards a more perfect union that I gladly choose to be a representative of America at its best.